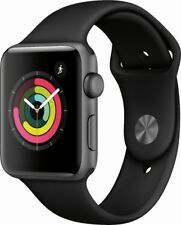 38 product ratings38 product ratings - Apple Watch - Series 3 - Brand New - 38MM - GPS-WiFi Bluetooth-1 Year Warranty! 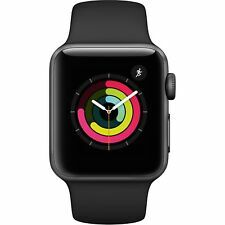 5 out of 5 stars - New Apple Watch Series 3 42MM GPS + Cellular Space Gray Case & Black Sport Band. 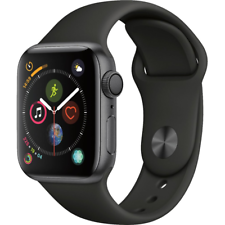 267 product ratings267 product ratings - New Apple Watch Series 3 42MM GPS + Cellular Space Gray Case & Black Sport Band. 3rd Party Olive Nylon Loop. 8/10 Condition. Light sings of ware on the body. Fully functional. iCloud unlocked. Ready for new user. Heart rate sensor. What's Included. Trending at $146.02eBay determines this price through a machine learned model of the product's sale prices within the last 90 days. 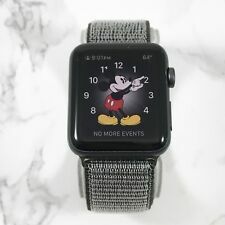 Apple Series 4 Watch - Space Gray. 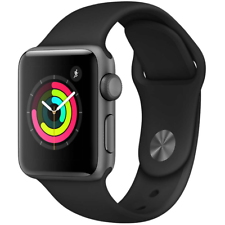 Includes: Apple Watch, band, charging cable, and USB Power Adapter. Black Sport Band. We respond to all inquiries within 24 hours and typically much sooner. We are here to assist you! Apple Watch. Original Box. You will get your item as soon as possible. Trending at $245.00eBay determines this price through a machine learned model of the product's sale prices within the last 90 days. Using Bluetooth®, Apple Watch connects to your iPhone to provide many of your phones functions, right from your wrist. Whether you’re at the gym, or driving to work, Apple Watch is your perfect companion. With more than 20,000 apps available from the Apple App Store, you can find one for virtually any function or need. To create their version of the world’s best digital watch, the team consulted watch historians to assist in applying classic watch design elements. Perhaps the most innovative was the digital crown, which appears to be a knob on the side of the watch just like those found on traditional watches. But, this one allows you to zoom in and out, access apps and navigate back to the home screen. The Apple Watch comes in three models called the Apple Watch, the Apple Watch Sport and the Apple Watch Edition. 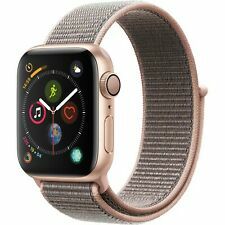 The Watch material is stainless steel, the Watch Sport is made from aluminum and the Apple Watch Edition is made from 18-carat gold. The Watch and Watch Edition feature sapphire screens, but the Sport has a lighter ion-x glass screen to go with its lighter construction material. There is also an Apple Watch Hermes for those who value style in addition to function. These feature handmade leather straps imported from Paris. The strap choices include Single Tour, Double Tour and Cuff, and color choices include Rose Jaipur, Bleu Agate, Étoupe and Anémone. The watches are available in two sizes: 38mm (38.6 x 33.3 x 10.5mm) and 42mm (42.0 x 35.9 x 10.5mm). Choose the size and features that fit your personal style and budget. eBay offers the Apple Watch in all styles from the original to the new series 3. The original Apple Watch doesn’t include an internal GPS, so it uses its connection to iPhone for determining location. The Taptic Engine supplies haptic feedback to alert the wearer when supported apps receive updates. The heart rate sensor uses visible-light and infrared light to monitor. 8 GB of RAM are included and there is storage for up to 2 GB of music and 75 MB of photos. There are many styles and custom bands to choose from. The Apple Watch Series 1 introduces a dual-core S1 processor and a lower price than the Original Apple Watch. The Apple Watch Series 2 features a new S2 dual-core processor. It is water resistant up to 50 meters. The display is twice as bright as previous models. It also contains a GPS, so apps that access location information no longer require pairing with an iPhone. Series 3 of the Apple Watch has a faster dual-core S3 processor. Bluetooth 4.2 is included. Bluetooth 4.2 features 250% faster data transmission and 10 times the packet capacity of earlier versions, along with features to allow apps to control power consumption and connections. Increased RAM, as well as processor speed means that you can have conversations with SIRI. The Series 3 also includes LTE cellular connectivity. What are the new features in Apple Watch Series 3? One of the models comes with LTE and UTMS. Yes, you can connect directly to cellular networks without your iPhone. Uses the same number as your iPhone and switch over seamlessly. Connects to AirPods for hands-free bliss. GPS – Lets you use your favorite travel apps without decreasing the battery time compared to previous models. Dual-Core processor makes it 70% faster than previous models, and with a new wireless chip for greater range and faster, more stable connections. WatchOS 4 – Allows you to use Apple Music to stream over 40 million songs, sync your playlists, and listen to internet radio. Barometric altimeter to show relative elevation. SIRI can now talk back to you using the built-in speaker. Heart Rate app now gives more detailed information and can notify you when your heart rate exceeds a preset limit. GymKit can connect to cardio equipment to precisely measure your exercise output. Apple Watch Series 3 now comes in silver, space-gray aluminum, new gold aluminum, silver or space black stainless steel cases. There are also quite a few new bands to choose from. Woven Nylon has a new pattern. Sport Loop offers easy adjustment and extreme comfort. Apple Watch Edition now features a dark gray ceramic case and two-toned Sport Band. Apple Watch Nike+ features a new platinum/black Nike Sport Band or Sport Loop. The Run Club app now features Audio Guided Runs to increase motivation and provide advice from top coaches. Apple Watch Hermès adds a new collection of bands, including the Single Tour Rallye with perforated Gala calfskin and the Single Tour Eperon d’Or in printed Gala calfskin. There is also a new watch face inspired by the Carrick Hèrmes watch. What are the benefits of watchOS 4? By using one process to run the UI and code of your apps, they become more responsive and quicker. The UI allows text over video animation and there is an autorotate feature to share your screen with friends. Bluetooth® connects directly to your apps, to give you immediate updates on data of fitness equipment that contain compatible sensors. These could be located on baseball bats, tennis rackets, surfboards, etc. and provide the quick feedback you need to improve your game. Apps can now be run in the background, and can use haptic feedback to remind you of appointments, navigation and information queues for travel, or other actions that require quick response. Use SiriKit to manage notes, arrange rides, send money or operate fitness apps. It’s as easy as telling your Apple Watch what to do. Workout apps have never been more helpful, with real-time advanced heart rate data (only basic data available on original Apple Watch), maps for keeping you on track, and accelerometer to help you meet your daily goals. Media and graphics have never been as accessible, with in-line video, audio and other features integrated into apps such as Game Center, SceneKit and SpriteKit. 2009 – Apple patented a wearable-tech device, which included monitoring bodily functions such as heart rate and blood pressure. 2011 – Apple files a patent for the iTime, which looks like a wearable Nano and features a headphone jack. It also has haptic feedback, accelerometers and a GPS. It uses gesture control, which seems like a probable future feature. 2013 – Apple patented the iWatch, which had a few features that haven’t made it into the Apple Watch… yet. It was a snap bracelet design with wraparound display, powered by kinetic energy charged by the wearer’s movement. It also mentions a virtual keyboard, although this idea proved awkward to implement. 2014 – In April, Apple patented a wrist-watch device. It had a square display, which was the first hint and what the finished Apple Watch would look like. It also featured a cell phone element and a camera. Maybe the camera will show up in a future version? 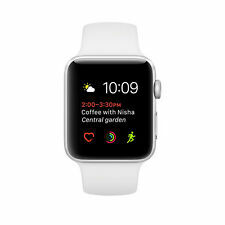 2014 – Apple Watch is announced by Tim Cook at Apple’s September 9, 2014 keynote event. Everyone is given a preview, but it won’t launch until 2015. Tim said that the Apple Watch was "a precise timepiece, a new intimate way to communicate from your wrist, and a comprehensive health and fitness device." 2015 – Apple Watch is released in April, but could only be ordered online. It reached Apple Stores in September. 2016 – Apple Watch Series 2 is released. 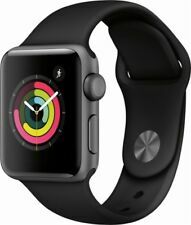 2017 - The Apple Watch Series 3 is introduced on September 12, 2017, with the announcement of iPhone 8 and iPhone X. The Series 3 is the first Apple watch that runs many features without being tethered to an iPhone. 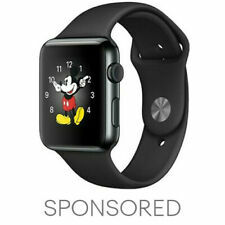 Come to eBay for the widest selection of Apple Watches. You’re sure to find the perfect one. As Graduation approaches, shop for gift cards, personalized commemorations, Apple Watches, and more to celebrate all that the students in your life have accomplished.